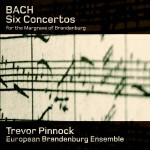 The European Brandenburg Ensemble is an international formation of two dozen specialist musicians from different backgrounds and of different generations, which Trevor Pinnock drew together to celebrate his 60th birthday. With them he chose to revisit Bach’s Brandenburg Concertos, which he first recorded with The English Concert nearly thirty years ago. 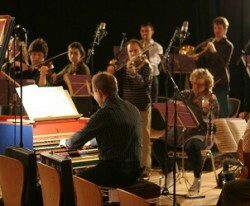 The Ensemble first came together in the summer of 2006 in a residency at the University of Sheffield and in December they met for performances in England and a recording of the concertos in the Sheffield City Hall for Avie. During 2007 and 2008 the Ensemble toured in Europe and the Far East, with great acclaim, from both audiences and critics.